Our YAC is seeking new members for the 2019-2020 school year. As our seniors graduate, we have to fill their seat at the table. This year, the YAC is doing open applications for those that are interested in serving our community through grantmaking, community service, and awareness projects. Additional information about the roles and responsibilites of a YAC member can be found on the first page of the packet below. The application follows the informational page. Applications should be submitted by April 10th for consideration. Join our Youth Advisory Committee for a fundraiser to grow the Youth Activities Endowment at HCCF! "We hope to continue our commitment to giving back to our community through grantmaking, awareness projects based on our needs assessment, and participating in community service." Enjoy a delicious spaghetti dinner from The Pasta House and support the YAC for only $10. Feel free to print and share the flyer below with your friends and colleagues. Our YAC is seeking new members for the 2018-2019 school year. As our seniors graduate, we have to fill their seat at the table. This year, the YAC is doing open applications for those that are interested in serving our community through grantmaking, community service, and awareness projects. Additional information about the roles and responsibilites of a YAC member can be found on the first page of the packet below. The application follows the informational page. Applications should be submitted by April 17th for consideration. Bad Axe - 2 seats open - preferably a current 8th and a current 9th grader. The Huron County Community Foundation Youth Advisory Committee (YAC) recently conducted their Needs Assessment Survey. These results will shape the YAC’s grantmaking and service projects in the upcoming three years. The YAC is the youth component of the Huron County Community Foundation, comprised of representatives from each of our area high schools. These students complete awareness projects, fund development initiatives, participate in community service activities, and award grants to local projects impacting youth. The YAC will accept grant applications in April for programs addressing one of the top three needs. If any local organizations are planning projects to impact one of these areas, please contact HCCF, as the YAC would love to collaborate around these issues. The Youth Advisory Committee is now accepting grant applications for their December grant cycle! As the YAC evaluates grant applications this December, any applications that directly impact one of the target areas listed above will receive preference. Applications for projects impacting other topics will also be considered. All application info can be found in the packet! Grant proposals must impact the youth of Huron County. Applications must be received by December 4th at 5 p.m.! Presentations will be held December 13th 8:30-9:30 am at the Tech Center in Bad Axe. The Youth Advisory Committee, comprised of representatives from each of the area high schools, met at their regularly scheduled April meeting to review grant applications from multiple organizations and hear presentations. The Youth Advisory Committee is now accepting grant applications for their 2017 grant cycle! Applications must be received by April 19 at 5 p.m.! Please note in the fillable pdf file you will need to click on the fill & sign button. Grantmaking is one of the highlights of the year for the YAC. We look forward to seeing the projects and programs impacting Huron County youth!! At our March YAC meeting, the students worked with Fleece and Thank You to make 13 fleece blankets. These blankets will be sent to youth who are in hospitals receiving treatment, It is our goal that the blankets will provide a pop of color and a sense of comfort and home to those who receive them. Two week before Christmas, YAC members visited residents in 4 local elder care facilities. They took their time together to make crafts, wreaths and candy canes, for the seniors to keep in their rooms as they celebrated the holidays. Below you can see pictures from these events. The Youth Advisory Committee (YAC) held their summer retreat on August 28, 2016 at the Huron County Fairgrounds. Seventeen out of twenty six kids were able to come spend the afternoon with their YAC Advisers. After lunch, the kids enjoyed a round of bingo, treasure hunt, and some team building activities. They then reviewed the best practices, and what is YAC? Officers for the 2016-2017 school year were elected: Co-Chairs-Halle Keim and Kaira Osentoski, Vice Chair - Brad Pettit, Secretary - Lauren Kranz and Treasurer - Alex Schornack. Planning & Idea gathering for publicity, fund development, community service projects were discussed. The Youth Advisory Committee is now accepting grant applications for their 2016 grant cycle! Applications must be received by March 11 at 5pm! On Saturday, February 20, nearly 20 YAC students gathered at Wilcox Park in Bad Axe to participate in the Human Development Commission's Annual Walk for Warmth. The proceeds from the event support HDC's heating assistance program. We are proud that our YAC won the Biggest Team of Walkers award at this year's event! Showing their spirit bright and early on a Saturday morning! YAC President, Daniel Rutkowski, accepts the Biggest Team of Walkers Award on behalf of the YAC! Biggest Team of Walkers. HCCF YAC. Exciting news from the Huron County Hockey Association and the HCCF Youth Advisory Committee (YAC)! HCHA is offering 10 full 2 year hockey scholarships to local youth, made possible in part by a grant from the YAC! The YAC, after completing their Needs Assessment in Spring 2015, saw that drug and alcohol use and abuse were the number one concerns for our area youth. To help combat that issue, the YAC was proactive in their grantmaking, seeking out organizations they thought could make a difference. The Hockey Association came up in discussion because it provides an alternative activity for young people to keep them healthy, active, and drug and alcohol free. Their other grant went to Everyone 4 Prevention, a group focused on substance abuse prevention education, to continue their work in our schools and communities. HCCF is excited to partner with these two great organizations to provide education and alternative activities to benefit our county's youth! Read the release from the Hockey Association below for more information on how to get involved. "The Huron County Hockey Association is very happy to announce that we - just this past week - received a very generous donation from the Huron County Community Foundation Youth Advisory Committee (YAC) as well as the United Way and wanted to share it right away with our community. The HCHA will be giving away Full - 2 year scholarships for the 1st 10 (Ten) kids ages 7 yrs. to 10 yrs. old that have never played hockey with HCHA and would like to play this year. This scholarship includes all fees and equipment (if needed) to play. To enter – send us a brief email to hchascholarship@outlook.com about what playing hockey would mean to you. Make sure to enter right away as 10 will go quick. Good luck to everyone and PLAY ON!!!" September 22 was the first meeting of the school year for our Youth Advisory Committee! Since new members are added each year to replace members who graduated, the group spent some time getting to know one another and learning to work together. The YAC is composed of students from all of the schools in the county who come together with a common purpose, to serve as a voice for the youth of Huron County and strive to improve the quality of life for those living in the county they call home. Each year, they complete community service projects, give grants, and work to raise awareness for issues facing today's middle and high school students. Making to through the "minefield" while depending on your teammates for directions was the object of this activity. The students discussed how its hard to understand what's happening when too many people talk at once and how that relates to meetings! YACers try to untangle themselves from the Human Knot while learning how to work together to accomplish a goal. May 21 marked the final YAC meeting of the 2014-2015 school year. It was a jam-packed meeting full of many activities. The first was a presentation from Michigan State University Extension Office on Tourism in Michigan, and specifically in Huron County. YAC students were divided into groups to develop a business model for a new tourism venture in Huron County. Ideas ranged from a "make your own milkshake- from cow to cup", to a winter themed water park, and even water biking. The next order of business was 2015 Grantmaking. This year, the YAC took a proactive approach, brainstorming and approaching programs instead of soliciting applications. The decisions were made with the 2015 Needs Assessment results in mind. Grant awards will be officially announced next month. Finally, new members were introduced to the group and seniors were given a final farewell. The YAC is graduating 11 seniors this year. We would like to thank them for giving their time and talent to the YAC and wish them the best in their next adventure! Students listen intently to at presentation from MSU Extension. April 12-18 is National Volunteer Week. In the spirit of the week, The Huron County Community Foundation’s Youth Advisory Committee (YAC) recently planned and participated in a service project that connected some of our area youth and senior populations. The YAC was approached by Steve Jais of the Human Development Commission (HDC) who brought National Volunteer Week to their attention. YAC Advisor, Emily Polega said “When Steve from HDC approached us with the idea of participating in National Volunteer Week, the YAC was immediately committed to the idea of finding a way to give some of their time and efforts back to our community.” The YAC thought this would be a great opportunity to connect different generations living in our community. Elementary students from Bad Axe, Caseville, Harbor Beach, EPBP Lakers, North Huron, Owendale-Gagetown and Ubly created spring art projects to share with residents at some of the local long-term care facilities in the area. 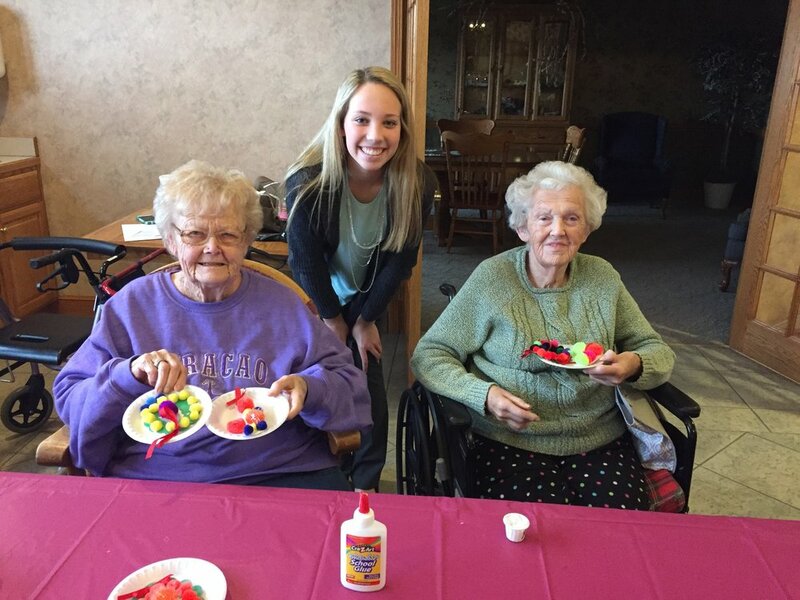 The YAC students then delivered the projects to residents at Courtney Manor in Bad Axe, Country Gardens in Pigeon, and Lakeview Extended Care Facility in Harbor Beach throughout National Volunteer Week. The students also took the opportunity to interact with the residents, chatting and playing games with them. YAC Advisor Emily Polega said “This was a fantastic opportunity for our YAC students to connect with different generations of people in our community. I was very impressed with our group’s ability to brainstorm, plan and execute this idea for National Volunteer Week. The residents that we were able to visit seemed delighted to have us as their guests, and it was wonderful to see our youth giving back to our community in this way.” The YAC would like to extend its thanks to HDC for encouraging them to participate in National Volunteer Week, all of the teachers who helped make this project happen, including Mrs. Schaefer, Mrs. Fischer, Mrs. Mayes, Mrs. Collier, Mrs. Brining, Mrs. Klee, Mrs. Rothe, and Mrs. Whitting, and to the long-term care facilities and residents for having us as their guests. The YAC members are already looking forward to participating in National Volunteer Week again next year. Students from North Huron and Bad Axe deliver spring pictures, drawn by elementary students, to the residents of Courtney Manor. The HCCF’s Youth Advisory Council would like to use the results from our recent Needs Assessment Survey of our area youth to make a difference in our community through our grant making opportunities! We are looking for organizations involved in the prevention of issues surrounding youth drug and alcohol use, as well as peer-to-peer issues such as bullying. We would like to be in touch with these organizations in order to determine where our grant funds can be best allocated to meet the needs of Huron County’s youth. Please contact our YAC Advisor, Emily Polega at yac@huroncounty.com by May 8th with a description of your organization and a contact person if you would be interested in being considered for grant funds from the YAC this year. These were the results of a Needs Assessment survey that asked Huron County 7th, 9th, and 11th graders what the biggest issue was in their community. The Huron County Community Foundation Youth Advisory Committee is performing a survey of the needs of Huron County youth this spring. This assessment will be taken by 7th, 9th, and 11th graders county-wide to have youth voices express the biggest issues facing young people in our county. Results will be published Spring/Summer 2015. When instructed to do so, please select the button below corresponding to your school and grade. Take the survey with complete honesty; it is anonymous and no one will be tracking your answers. Again, please select your school and your grade when instructed to do so. The Huron County Community Foundation Youth Advisory Committee (YAC) is prepped and ready for a large undertaking: surveying every 7th, 9th, and 11th grade student in the county. Just like the Foundation surveyed community stakeholders in 2014 to hear about the role the Foundation should play in Huron County's future, the YAC is taking on the same task for area youth! Every three years, YACs across the state of Michigan perform "Needs Assessments" of their local students. The HCCF YAC customized an online survey, taking under 10 minutes to complete, that asks the students about issues like alcohol, drugs, peer to peer relationships, and technology resources. The Needs Assessment is important to the YAC because it will help determine their awareness projects for the next three years and help them allocate their grant dollars. The YAC is comprised of students from each of Huron County's high schools. These YAC students will be administering the survey in their schools. This truly is about the YAC students wanting to know what issues are facing Huron County teens and how this group can best help to bring awareness to those issues. The YAC is led by their new advisor, Emily Polega, and will be approaching school administrators soon to start the process. Polega said, "I am excited to take on the role of YAC advisor and look forward to working with the YAC students to help guide them in their grant making and programming to meet the needs of our area youth." Upon completion of the survey, results will be published on the Foundation's website, in a press release, and disseminated back to the school administrators of participating schools. Huron County Community Foundation Executive Director Mackenzie Price noted, "This is a great opportunity for our YAC to get the honest opinions of their peers on issues high school students face every day and give their classmates a chance to be heard." Check back for survey results in Spring 2015. The YAC is excited to announce that it's time for Cardboard City! Huron County youth will be sleeping outside, on the lawn of the Huron County Courthouse, to raise awareness for homelessness in Huron County. This year's event will begin the evening of November 7, 2014 and end the morning of November 8th. Last year, 100 students participated in this awareness event, each raising $25 in pledges. We are hoping for an even larger event this year! All funds raised from this event will be added to the YAC fund for upcoming awareness initiatives and community service projects. Click the button below to check out the 2014 Cardboard City packet for more details, consent forms, and pledge sheets!